Why Art Thou Thus Cast Down, My Heart? 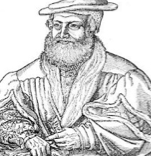 Hans Sachs was a 16th century German poet and playwright who also belonged to the exclusive guild of Meistersingers. These were mostly men of the German middle classes who specialised in unaccompanied singing and lyrical composition. As an aside he also worked as a shoemaker, a trade that he learned as a boy and that he kept up throughout his life. He was born on the 5th November 1494 in the northern Bavarian city of Nuremberg, the son of a tailor. He was educated firstly at a singing school and then at a Latin school, both of which were in Nuremberg, and these experiences prompted him to develop an interest in verse and music. Perhaps following his father’s lead though, on leaving school he decided to learn a trade and became an apprentice shoemaker. He completed this at the age of 17 and then took to the roads as a journeyman craftsman, accompanied by others, visiting such cities as Munich, Leipzig and Salzburg. By the year 1513 he found himself in Wels, Austria and he was now dedicating himself to fine arts and literature. A visit to the town by the Emperor so impressed the young man that he applied for a position at the royal court and Sachs found himself working inside the palace at Innsbruck. His wanderlust took over though and, after a short while, he was back on the road. Reaching Munich once more he decided he would like to become a Meistersinger. In 1516 he was back home in Nuremberg and this is where he remained for the rest of his life. He was married twice but neither wife bore him children. The Reformation was to have a significant effect on his life and he became a great follower of Luther, so much so that he wrote a poem in his honour. Die wittenbergisch Nachtigall, Die man jetzt höret überall, which roughly translates to The Nightingale of Wittenberg, became extremely popular and is still known to this day. Initially though there was some resistance to this new faith and Sachs was, for a while, banned from writing any more in support of it. The council relented though in the wake of a nationwide acceptance of the new order. Sachs was a prolific writer and some historians suggest that he may have been responsible for, either wholly or in part, at least 6,000 pieces of work. The bulk of these were Meisterlieders, or Mastersongs, and this is remarkable in itself as it was not common for mastersingers to perform their art for financial gain. It is just as well then that he had learned the trade of shoemaking to sustain him. Hans Sachs lived a long life. His death is recorded as the 19th January 1576 when he had reached the age of 81.